Fred L. Markham graduated from Brigham Young High School on May 28, 1919. He became one of the most respected architects in Utah, and a great influence on the development of the upper campus of Brigham Young University. Fred Markham was born on July 3, 1902 in Spanish Fork, Utah. His parents were Joseph Markham [BYA High School Class of 1886] and Mary C. Lewis [BYA High School Class of 1892]. Knowing the value of education, Fred's family moved from Spanish Fork to Provo, and in the fall of 1911 he started at the Brigham Young University Training School in the Fourth Grade. He entered Brigham Young High School in the fall of 1915 and graduated in 1919. As a senior he served as the White and Blue Reporter, a prized office. His brother, Joseph Aldus Markham, graduated from BYH one year earlier, in 1919. His sister, Lucile, graduated from BYH several years later, in 1925. In 1923 Fred L. Markham earned a Bachelor of Science degree from Brigham Young University with a major in mathematics and a minor in chemistry. During his college years he continued to participate as a member of the White and Blue student newspaper staff. He served as editor of the BYH Banyan yearbook of 1921. A good athlete, he was a member of the BYU track team in 1921-1922. He participated in varsity dramatic plays in 1920, 1921 and 1922. He was elected president of his BYU Junior Class in 1922. Following university graduation, he served an LDS mission to the Eastern States in 1924-1926. After his mission, he studied at the Massachusetts Institute of Technology School of Architecture from 1927 to 1930. Returning to Utah, he taught intermittently at Provo High School, and Granite High School in Salt Lake City, 1922 to 1935. Fred married Maude Dixon [BYA High School Class of 1919] on June 25, 1924 in Salt Lake City, Utah. Maude graduated from BYU in 1924 with a BS Degree in English. She became a member of the faculty at BY High. Fred L. Markham and Maude Dixon Markham had two daughters and two sons: Diana Markham (Gary) Stewart, Terre Haute, Indiana; Barbara Markham (Weldon) Daines, Salt Lake City, Utah; John Markham and wife, Reeda, Provo, Utah; and Dixon Markham and wife Junece, Provo, Utah. Maude's parents were John De Grey Dixon and Sarah Ann Lewis Dixon. In 1930 he began his practice as an architect with Claude S. Ashworth. He opened an office for personal practice in 1939. Brigham Young University liked his work, and became one of his major clients. Thomas L. Martin Building, 1969, in collaboration with other architects (Nelson, Dixon and Long) to form Central Utah Architects for this design. and participated in other projects until his death in 1984. 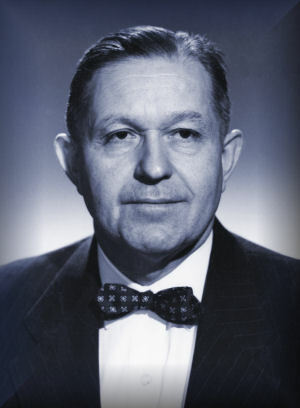 In addition to the design of individual buildings, he actively participated in the overall campus design plan, working closely in later years with Mr. Sam F. Brewster of the BYU Physical Plant. Fred Lewis Markham died on September 28, 1984, and Maude Dixon Markham died on September 4, 1985, both in Provo, Utah. Fred L. Markham, top, second from left. 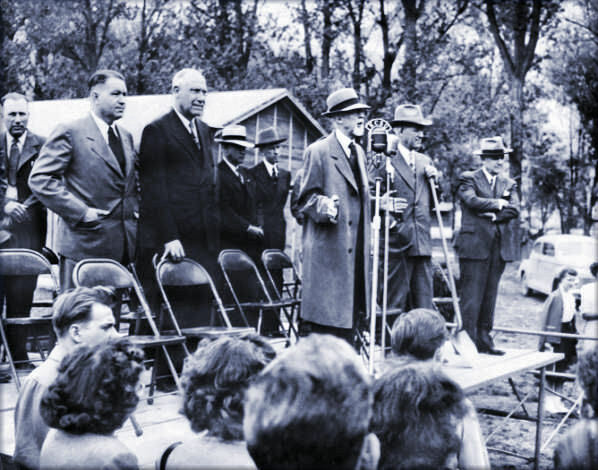 Church President George Albert Smith, center, speaking at groundbreaking ceremonies for the Carl F. Eyring Physical Science Center on May 11, 1948. The procedings were broadcast live by radio. On the stand with him were Fred Markham, hand in pocket, Architect; Dean Carl F. Eyring, in whose honor the building was named; BYU President Howard S. McDonald, with shovel; and Elder Stephen L. Richards, member of the Council of the Twelve Apostles.